I thought this might be a great place to discuss our newly developing downtown. I have a few things in mind: What are some opportunities that we should take advantage of with construction of our downtown? What are some obstacles do we face? Advantages: Central location in the city and region - about halfway between Norfok and the Oceanfront. - Easy access (although can be congested at times) from the interstate. - Plenty of businesess already about in the CBD. Good synergy and I think has a good sense of place. - A highly desirable place to live, play and work in one small area. Few places in the city can offer that. - Traffic is becoming an issue and it is anybody's guess when the city will take actions to alleviate it. I am sure there are other disadvantages but at the moment I don't have time to devote to this. Perhaps others can chime in. Very quickly, as far as opportunities, I think the city should heavily capitalize and heavily promote the center from within. We offer an educated workforce and the city could build to suit a tower for companies to locate here. The city needs to do more (IMO) on offering incentivies for higher paying jobs to locate here. This is probably a long ways off but in related traffic news, I found an interesting article in this week's Portfolio. So would this be our version of the of the big dig? I cannot imagine the cost of such a thing! Proposals include dropping Independence Boulevard underneath Virginia Beach Boulevard, allowing the two multi-lane roads to avoid direct connection. And where do they plan on getting the funds from? We already know that the state is out of the picture. Are they going to raise taxes somewhere? This city has millions in a "rainy day" fund, I'm sure they can start saving up the duckies. Remember, this area is getting TIF revenue and it's growing every year. Are there Federal grants, that can be applied for if state won't help? Exactly. It would be interesting to find where all those TIF funds are being diverted to. I think Indy should go over Independence. I would advocate express flyover lanes (bypass) that start before Jeanne and continue elevated above Indy before finally merging back with Indy south of Baxter. The interchange at 264 would be reworked with connections from both the existing Indy (local traffic) and express Indy. There would still be a light at the Blvd but because of the reduced traffic on Indy, the light would stay green much longer for the Blvd. This is in addition to the Constitution extension and connection with Edwin and the Kellafrom where the funding will come. I saw a beautiful graphic of that Independence VB Blvd grade separation a year or so ago. It would be very expensive, but we can dream, can't we? More realistically, we really will need expansion of the I 264 Independence connection. Flyovers have been envisioned both on the east and west sides, but the east side has been all but ruled out because of new office development/political resistance. The west side could be even more problematic because of the presence of existing housing. So some fresh ways may be needed to confront the access problem to Pembroke (I'm not calling it Town Center unless someone sticks bamboo under my fingernails). Maybe the Witchduck and Rosemont interchanges can be redesigned, and some additional slip ramps put in near Independence, along with some one-way streets, new signalization and some better transit options (i.e. light rail and shuttles) put in place. It's possible to improve things, but if the area is going to function like a downtown, more congestion is going to be a part of the ambience. Downtown congestion would be okay if it didn't involve the two major roads in VB. With really only one true limited access highway (although 64 does slice through a couple miles on the west side of town) VB relies on its surface roads. Indy is the major north-south route and it is getting choked at Pembroke. Keeping traffic moving between the north and south sections is imperative. I do like the Witchduck interchance redesign idea. I would take it further and revamp the Witchduck/PA intersection beyond what is planned to basically align Witchduck with PA. This way Pembroke Blvd/Witchduck at Indy would be a bypass around the Pembroke area connecting to PA Blvd to southern VB. Yeah, transportation would be Town Center's biggest disadvantage, or problem right now. As it stands, Hampton Roads is at the end of 64 which is bad enough. However, Town Center lies almost at the end of 264 which is a dead end again. Virginia Beach would be wise to fix this critical problem, because it will catch up with it soon. on a side note of pointless information. I measured out the blocks of the town center area, not including the side of the street the lake is on, or even the shopping center that Planet Music is in. But by that alone, the town center is roughly the same size as 18 of Portland's 200x200 blocks. Not sure if I ever posted this but here is a very good article on the Town Center and related pembroke development. Pembroke is a case study of Saunders' philosophy in action. Town Center did not happen because city officials made it happen. The impetus came from a group of landowners who organized around 1985 with the goal of creating a comprehensive plan for their business district. The Central Business District Association hired a planning company to create a vision for how the district might take shape. The association lobbied for a special zoning category that would permit dense urban development in the 340-acre district. Saunders and Divaris then hunted for a developer willing to take on the Town Center project. Finally, around 2000, local developer Armada Hoffler stepped up to the plate. "The city government cooperated," Saunders says. "But these initial steps were all privately funded." Where others perceived a decaying tract of suburbia, Saunders saw hidden assets that would make Pembroke successful. 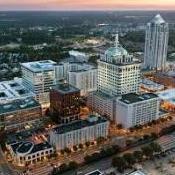 First, Virginia Beach, a municipality of a half million people, had no other center of gravity competing for the status of central business district. Pembroke had as good a shot as any other location. Second, the district stood at the intersection of two major connectors right off Interstate 264, which runs between downtown Norfolk and the Virginia Beach resort area. Says Saunders: "It's an important place." Third, local streets were laid out in a grid pattern, allowing people to drive around without clotting the main boulevards. Revisionist history? Didn't the City have a lot to do with TC coming about? Didn't they dream about a downtown in Pembroke for several decades? Didn't they produce a couple downtown-oriented comp plans for the area? Didn't they broker a deal in the mid 90's with a REIT during their financial height only to have the deal fall through when REITs took a hit? Didn't they block other developments until another downtown proposal came about? Aren't taxpayers footing the bill for the garages, plazas, infrastructure, and PAC? This article is not only understating the City's role in the conception of Pembroke as a downtown; it totally ignores it. Our developing DT now has a website. Although the public input meetings are over, more are are slated next year for February or March. Me either. I found it in the newspaper. For better or for worse the City did have a lot to do with that area developing into a downtown. It was a collective vision. Hell, even I envisioned a downtown-like development in that location in back in 1968 when I was a school-boy. The idea probably came about from the very bright and urban lighting and road improvements that accompanied the development of Pembroke Mall. That created a cognitive dissonance with the mall juxtaposed with the woods across the street. Lots of people were probably affected that way and may have forseen something big there. I dropped them an email just now. I think they need to consider at some point light rail will probably come to the city, at least some other type of mass transit. And with Pembroke developing so quickly there is little land left to build a station. In addition, I think they need to build crosswalks to cross Indy at Columbus.. especially when Citywalk gets built.